A new bike shop has opened in Streatham. 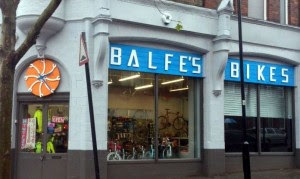 Balfe's Bikes opened at 87 Streatham Hill, SW2 4UB on 1 October 2012. The new shop is joins the other Balfe's Bikes in Kennington, Lambeth which opened in July 2011. The new shop (pictured, left) opens on the site of Phillips, a previous Streatham bike shop. More information on the Balfe's Bikes website, Facebook page or contact 020 8671 1984.